What is an Email Anti Spam Service? An email anti spam service is a service that complements an existing email filter in order to increase its spam detection rates. Typically, a standard email filter detects around 97% of spam emails, increasing to a spam detection rate of around 99% when acceptable spam thresholds are adjusted upwards. However, in some larger businesses, a spam detection rate of 99% is insufficient to prevent the business continuing to receive a considerable volume of spam. As the 1% of spam emails that avoid detection are likely those with the highest level of sophistication, they are also those with the highest threat level. Furthermore, by raising acceptable spam thresholds too high, genuine emails can be quarantined as spam (false positives), delaying the delivery of business-critical communications. An email anti spam service with a high spam detection rate can resolve this issue without causing unreasonable delays. An email anti spam service has many of the tools commonly found in existing mail filters. These include RBL and SURBL filters, recipient verification and Bayesian analysis (the tool that rates the level of spam in each email for the purposes of blocking it or allowing it subject to the acceptable spam threshold). Whereas RBL and SURBL filters are good at detecting emails from known sources of spam, if a spammer uses a different server with a different IP address, the filters are ineffective. By comparison, an email anti spam service has a greylisting function to detect emails from previously unknown sources of spam. The way the greylisting function works is to decline every inbound email. The email is returned to its originating server with a request for it to be resent. Normally, the email will be returned within a few minutes unless the originating server is too busy to respond to the request. In most cases, spammers´ mail servers are too busy sending more spam emails to respond and the spam email is never returned. Along with the greylisting function, an email anti spam service employs antivirus software, the Sender Policy Framework protocol and HELO tests to minimize the volume of spam a business receives. By using these tools in conjunction with the tools commonly found in existing mail filters, an email anti spam service can achieve a spam detection rate in excess of 99.9% – often with no false positives. Acceptable spam thresholds can be difficult to get right. Set the thresholds too low, and the business is inundated with spam. Set the thresholds too high and, as mentioned above, business-critical emails are quarantined in error and have to be manually delivered by system administrators. Further difficulties arise when one department requires a different acceptable spam threshold from another. Finance departments may want a high threshold to protect employees from spoofed email, but this could create concerns from sales departments about the timely delivery of sales leads. An email anti spam service can overcome this issue by allowing administrators to apply different acceptable spam thresholds to different groups of employees. Indeed, different thresholds can be applied to individual employees if required, and the process is made easy by having the facility to integrate spam detecting services with directory tools such as Active Directory and LDAP. In addition to the integration facility, each business´s email anti spam service is managed via a centralized administration portal. Administrators can adjust acceptable threshold levels, whitelist or blacklist senders, and control web authentication settings with the click of a mouse. Once the optimal settings have been established, an email anti spam service is a set and forget solution to spam emails. 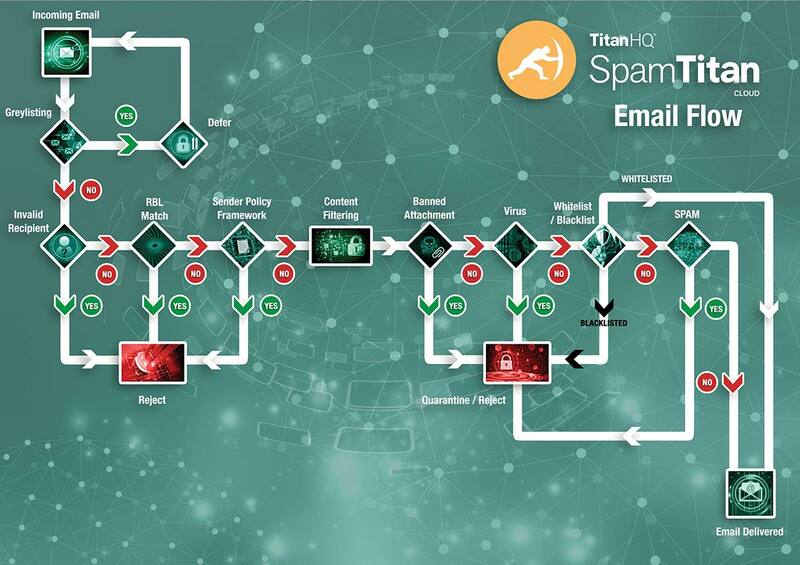 SpamTitan is a versatile email anti spam service which achieves award-winning spam detection rates with the minimum of maintenance overheads. SpamTitan can be deployed within minutes as a virtual appliance or as a cloud-based service and has a quick set-up procedure to assist with configuration. Once connected to our servers, administrators log in to the web-based administration portal, enable our advanced email filtering tools, and adjust the default acceptable spam thresholds if required. Administrators can also schedule quarantine reports to advise of blocked emails. SpamTitan has many other features that can help enhance the security of a business´s network. Outbound scanning, for example, can help identify compromised corporate mail accounts and malware that has avoided detection by antivirus software. Administrators can also drill down into historic data in order to conduct risk assessments and identify the sources of email-borne malware. To find out more about the features of SpamTitan´s email anti spam service, and to request a free trial, do not hesitate to contact us. The best spam filter for business use will depend on the needs of your business and the level of protection you need. Our team of Sales Technicians will be happy to answer your questions and explain more about how each of SpamTitan´s features applies in your specific circumstances, before guiding you through the registration process to try SpamTitan for free.